Burmester 911 mk3 | What's Best Audio and Video Forum. The Best High End Audio Forum on the planet! "I continue to draw the same conclusion with the 911 MK 3. It has a huge, three-dimensional soundstage that I would normally associate with tubes, with the pace and drive I would normally associate with solid state, yet the weaknesses of neither. After six months of listening day in and day out, I can find no fault with the Burmester 911 MK 3 and am happy to say that this will become my new reference amplifier. It was dropped off of a truck on its way to me and I’ve often played it continuously for 24 hours day after day when breaking in new speakers, and it’s never let me down in any way. The 911 MK 3 offers perfect balance in my book; it is highly detailed and articulate, yet not harsh, and it is tremendously musical without being dark or rolled off in any way. This is truly the best power amplifier I have ever experienced. I can’t recommend it highly enough." "Quite simply one of the best-sounding solid-state amps to thus far lighten our doorstep. It is an advance over the earlier Burmester electronics in that it is not only close to completely neutral but it shows no trace of the normally ubiquitous transistor texture and grain in the upper octaves. More interesting yet, to these ears, is how happy it is driving all sorts of speakers, from the ultra-revealing Kings to the sweetly euphonic Coltranes. An amp for all seasons, and virtually all setups." "And that, ladies and gentlemen, is what the 911 brings to the table: Honesty, brilliance, totally clear and absolutely refined sound, great power, adaptability, and pride of ownership. If it is within your means, purchase at your pleasure. Is one note worth near 20K? I think Beethoven may have thought so. Very highly recommended." "Such a sky-high price tag leads to massively high expectations when it comes to build, finish and performance. And the biggest compliment we can pay to the whole amazing pre/power set-up is that it’s every bit as good as you’d hope. This is one case where you really do get what you pay for." So, whether this still remains "the world's best amplifier" even in my opinion, everything the Burmester 911 offers is tough to beat (and a pair in mono mode is even more spectacular) It has never had a problem driving any speaker I've used it with for review, does not get as warm as a class A amplifier and provides enough of the magic available from the world's finest tube amplifiers, that I don't feel the need to hunt for NOS tubes anymore. I still use a handful of amplifiers as reference components for different things, but the 911 is still the go to amp in the stable. Much like it's four wheeled counterpart from Porsche, the Burmester 911 does so many things so well, it's tough to want to go elsewhere. Sure a Ferrari offers an even higher level of ultimate performance, and an Aston Martin more luxury (though the current spec 911's are getting pretty close in that dept.) and maybe the Lambo a little more cache, but it's tough to find a car that does so many things right at this price that you actually can drive day in and day out. The same goes for the Burmester 911. And for those needing a touch of tubey - ness, the ARC REF 5SE makes a brilliant match for the 911mk. 3. Not necessarily a better sound than going with all Burmester, but a nice variation on the theme. I suspect this amplifier will be here three years down the road as well. Knowing Burmesters commitment to updating old models, should they ever produce a mk.4, it will just mean a trip to the factory for an update. Jeff, thanks a lot for that, much appreciated! Very interesting to read your thoughts 3 years down the line of your original 911 review. As a 911 owner it is comforting to hear that your thoughts have not changed after exposure to so many top tier amplifier designs. As tempted as I am to go for a second 911 ... my single 911 drives my standmount TAD CR1 speakers with such ease that I wonder if it will be a worthwhile upgrade. I'm sure it will be, and I suppose I can experiment with mono, vertical and horizontal bi-amping so it could be a fun exercise down the line when I get upgradeitis. I had the privilege to borrow a 2nd 911 from the US importer for a while and the jump in performance was greater than I expected. It wasn't in the budget for me then, but I am still thinking about it! If you have a Burmester dealer nearby, see if you can arrange an in home demo, that is the best way to see if it makes the most sense. I just used them as mono blocks and was very satisfied with the changes. More dynamics, even more bass grunt, etc etc. ... I suspect this amplifier will be here three years down the road as well. Knowing Burmesters commitment to updating old models, should they ever produce a mk.4, it will just mean a trip to the factory for an update. I feel somewhat vindicated.. I've been a Burmester fan for a very, very long time .. I have owned Burmester components and know for a fact how good the 911 is . I am now almost ready to go back to the game. I was however not prepared to accept the improvement brought by the MkIII over the original ... As I have said I am intimately familiar with the 911 Mk1 and the MK III is that much better. In my book it has all of what we , audiophiles associate with the better Class designs yet runs barely hot albeit much warmer than the MK1... The midrange is luscious but not at the expense of extended treble.. if you think krell has serious low bass then listen to a 911, actually most any Burmester ... Meanwhile owners of the original 911 can upgrade to MK III.. Awesome to read your posts again. Thanks for the update. I understand that factory mono 911's from the start are even better than the stereo amps with the Y-adapters and even bett than a 909mk5 stereo amp. I should see my pair mid next month. I can't wait to hear them on the TAD CR-1's. Do you have any input/feelings on the 111 Reference Music Server? I hope to get more info on it. Frantz, if you are in the region early May, come hear the mighty Burmester 909 Monos driving the legendary Genesis 1 We will be burning-in the 10th Anniversary Genesis Dragons probably from 1st May to 9th May. In fact, all WBF members are welcome. I also regard the Burmester 911 as one of the best amps of all time. The North America distributor of Burmester is a good friend of mine, but I'm pretty sure that I met him after I said on this forum that I loved the Burmester 911. I(...) And for those needing a touch of tubey - ness, the ARC REF 5SE makes a brilliant match for the 911mk. 3. Not necessarily a better sound than going with all Burmester, but a nice variation on the theme. Could you give us some details how you connected the ARC REF5 SE to the 911mk3? Burmester 911mk3's only have balanced inputs. I assume the ARC has balanced outputs or else an adapter would be necessary. I think Jeff likes Cardas Clear cables as well. I'm sure Jeff will answer, but I suspect single ended, on paper its a perfect match (and conforming to ARC's interesting spec of a 20k min load- normally its min 10x the output impedance). ARC REF5 SE (and REF40) output impedance: 600 ohms Balanced, 300 ohms SE main (2), 20K ohms minimum load. Wow...this has been a great thread to read...ii undoubtedly will re-read it, and click on the links provided above for further details. Joe - good luck with your monos! Sounds like this might be end of the amp line for you! Wow!!! Gary - I have never had the chance to hear Burmester, but i know you have heard the Gryphon Colosseum...how do they compare, if you can. Both in terms of sonic signature, but also in general which you prefer and why. Thanks for any guidance! Thanks. I can't wait to get them. I'll keep you updated. I know Jeff from Tonepub has great taste and reading his early reviews of the Burmester gear got me hooked. At the risk of incurring the wrath of my wife - Gryphon blonde, Burmester brunette. Thanks. But thinks do not seem so easy - I found in a french review of the 909 that an adapter is needed for this conversion and I am curious about this aspect. May be the 911 is similar. 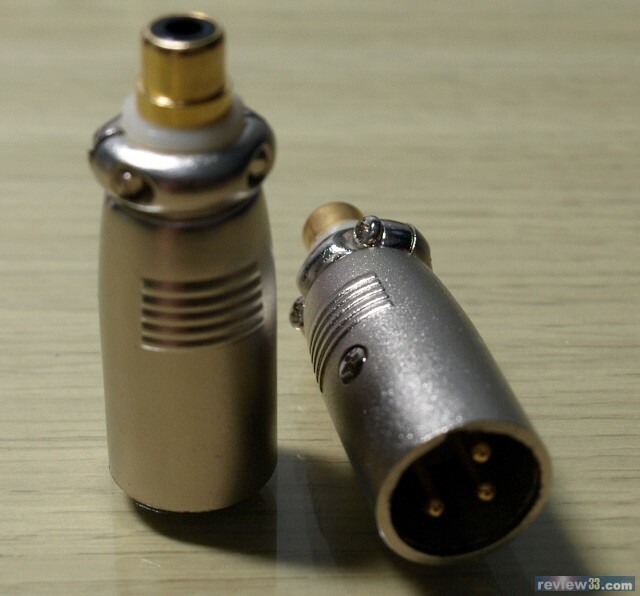 The 911 comes with XLR-> RCA adapters, so you can use a RCA cable.